We are a moving company from Berlin-Friedrichshain. 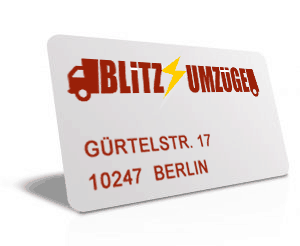 Thank you for your interest in moving company Blitz Umzüge. We are a Berlin moving company with many years of experience in the field of removals, whether it is a simple transport, a company move or an extensive private move. Parades are our passion! We have been conducting relocation and removal services in general since 2005 in Berlin, Germany or a country in Europe. We are proud that for so long we have been making sure that more and more people arrive in and around Berlin, safely with sack and pack in their new domicile. What makes us wonder? We are not a huge company where the customer is just a number. With us you get a personal service from one of our employees in the office. We also try to make short-term appointments possible for you. The fastest way to get a personal offer is to fill in our specially developed moving calculator. This can be found on our homepage. We are also happy to visit you at home, are there for you on the phone and are also available to advise you by mail. We are reachable from morning to night. Our team is committed to making sure that you feel comfortable with us and arrive with all your belongings where you want to go. If you have any questions, please do not hesitate to contact us. By phone at 030 66763154 from Monday to Saturday btw. 8:00 and 22:00 pm or via e-mail or website around the clock.